Happy Thanksgiving everyone! Although we did get a little snow last week here in Big Bear Lake, it looks to be a pleasant holiday weekend ahead. The roads are clear, Bear Mountain is open and Big Bear Snow Play is open as well. 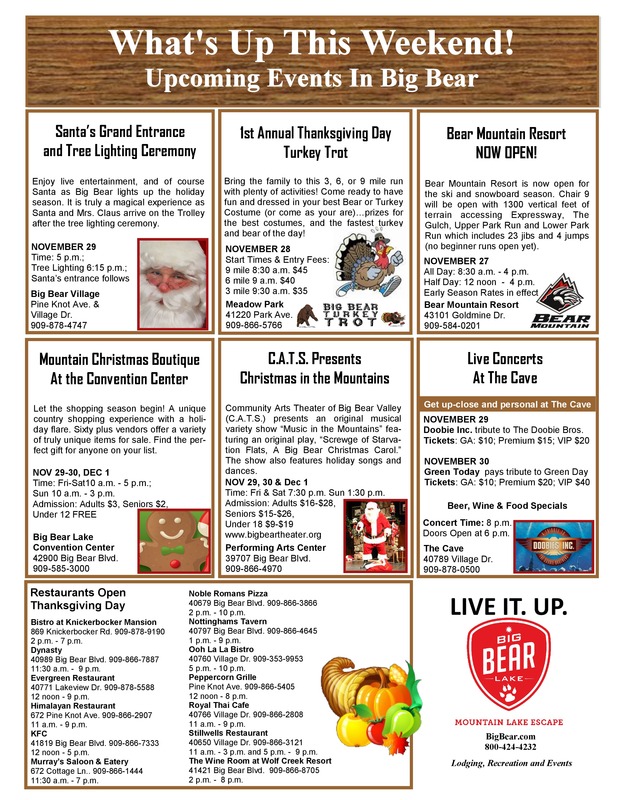 There are several special events happening too, so be sure to take a peek at the events flyer below. Cabins are filling up fast for the coming Christmas and New Years holidays, though we do still have a few left. If you would like to experience the Holidays in Big Bear, be sure to visit our website at RSVacations.net and take a look at our lovely cabins and find the perfect place for your family. Hurry before they’re all gone! !